I wish I could be more on top of things like housework and errands. Truth is, when work is crazy, things like doing laundry, vacuuming and running out for groceries tend to slip my mind. But somehow, cake stays on my brain. That's why I like this cake because you're probably got everything you need right now in your kitchen. No eggs or dairy required. No fancy ingredients. No need to run to the store in the pouring rain in the middle of the night. Relax, you've got this cake covered. If your freezer is anything like mine, it's stuffed to the gills. 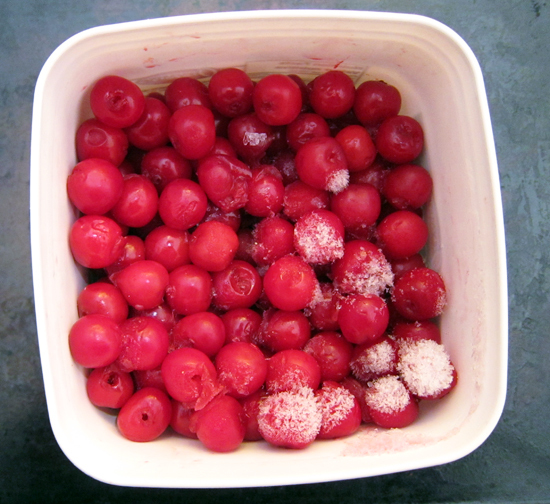 After I bypassed the brown bananas, frozen loaves of bread, and unmarked containers of vegetable stock, I discovered some sour cherries hiding in the back. I love cherries...especially in February. You don't have frozen cherries? Frozen blueberries would also be tasty here too. Or raspberries. Or chopped up strawberries. You get the drift. 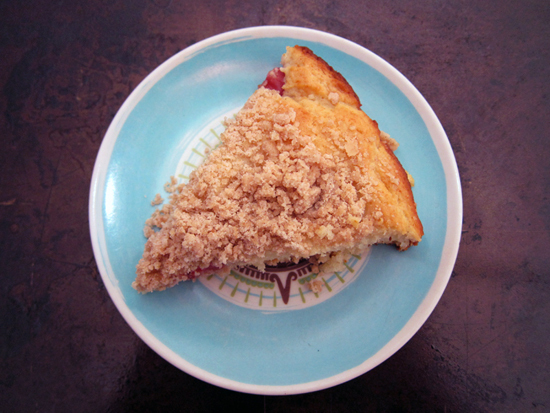 Oh, and did I mention that besides being a fine late-night snack, it also makes a damn fine breakfast cake. Yup. Preheat oven to 375F. Grease and flour an 8 inch cake pan or square pan (I used a nine inch round pan, no biggie). In a large mixing bowl, pour in the milk and vinegar and let sit for 5 minutes. Pour in the sugar, oil, and vanilla extract. In another bowl, combine the flour, baking powder, nutmeg, cardamom and salt and use a whisk to aerate the mixture. Dump in the flour mixture into the wet ingredients and mix until smooth. Stir in berries if using. Pour batter into prepared cake pan and set aside. In a small mixing bowl, mix together the flour, sugar and spices and then add in the margarine with your fingers. 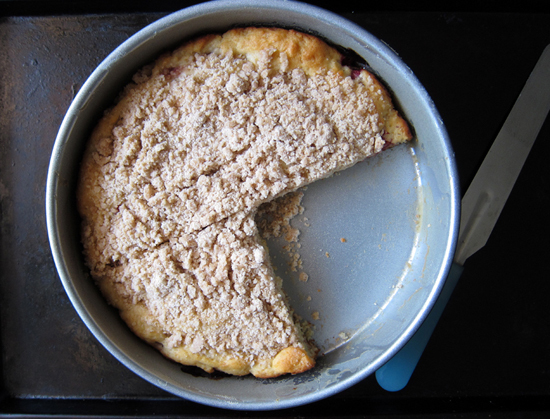 You want to create large crumbs. 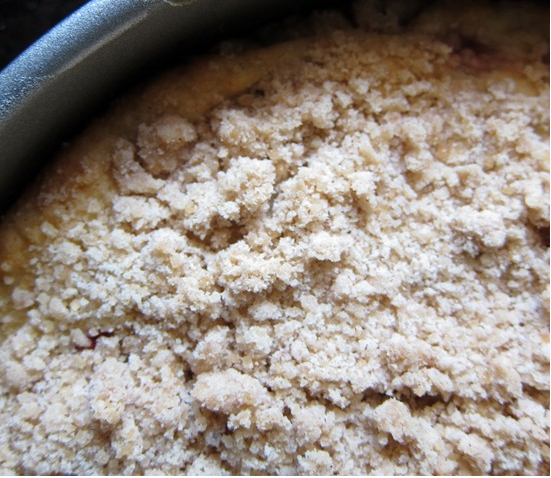 You can add more margarine if you want more crumbs, but don't sweat it - sandy crumbs aren't bad either. Scatter over the top of the cake and bake for 30-35 minutes. Test cake with a knife and if it comes out clean you're done. Let cool on wire rack. Slice and eat! Me and my husband are vegan. I'll give it try. It looks yummy! Simply divine - I'm off to make some! isa is my favorite author. this recipe is delicious! you will mak it again and again.